SHOES FOR BARBIE "MADE TO MOVE"
Here is the second post from the series about my playscale shoes collection. Dolls on "Made To Move" bodies have the smallest feet amongst my girls in 1/6 scale (I wrote about it here) so they can borrow shoes from many others. Are these shoes not too big though? 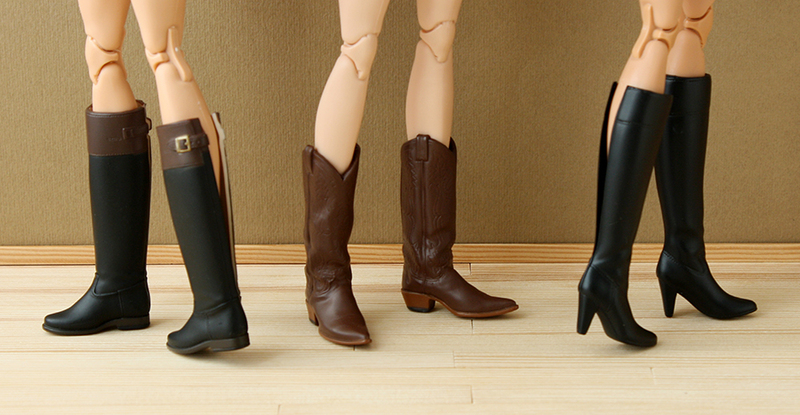 Momoko boots fit Barbie MTM well. Sneakers are also a good size. Mary-Jane pumps are too big but you can take photos in such a way that they look quite nice. Dark green pumps are good. Sandals are also loose-fitting (they fit perfectly with socks). Button short boots fit well and bone ankles (so the doll could stand without support - it's important because most of my Barbies don't have tight ankle joints). T-straps and other shoes in the photo below are a little too big. Flats on the left are too big for narrow feet. Flats on the left are too tight (some could be wear and some are too small in counters). Cowboy shoes fit well. High boots are too small in calfs (but it is visible only from the back). Below you can see shoes from Momoko that are the best for Barbie Made To Move in my opinion. What about shoes from current Fashionistas? Sandals and gladiators boots are ok. These high heels fit Barbie MTM too. Black shoes are good, caramel heels are slightly too small (only from the back). Pink loafers fit great. White and grey oxfords are very tight, the same as the black ones. And the grey/silver shoes on the right are completely too small. Black and white heels are from older Fashionistas and they are too small (black) or too high (white). Lilac ones are high but they fit, purple ones look not very well. Brown shoes are quite loose, pink have too short heels and black pumps are ok.
Vintage Barbie shoes are too small. As you could see, you can find a lot of shoes for dolls on Made To Move bodies. Thank you for the shoe review. I have also used Sparkle Girlz shoes and they work too. I am going to check out Momoko shoes as you suggest. You are welcome. Thank you for letting me know about Sparkle Girlz shoes. Love this shoe review! I am a big fan of the MTM body and I never really thought about using Momoko shoes for them. I have used some Momoko shoes on Poppy Parker feet though. I too have used some of the Sparkle Girlz shoes too. Thank you. 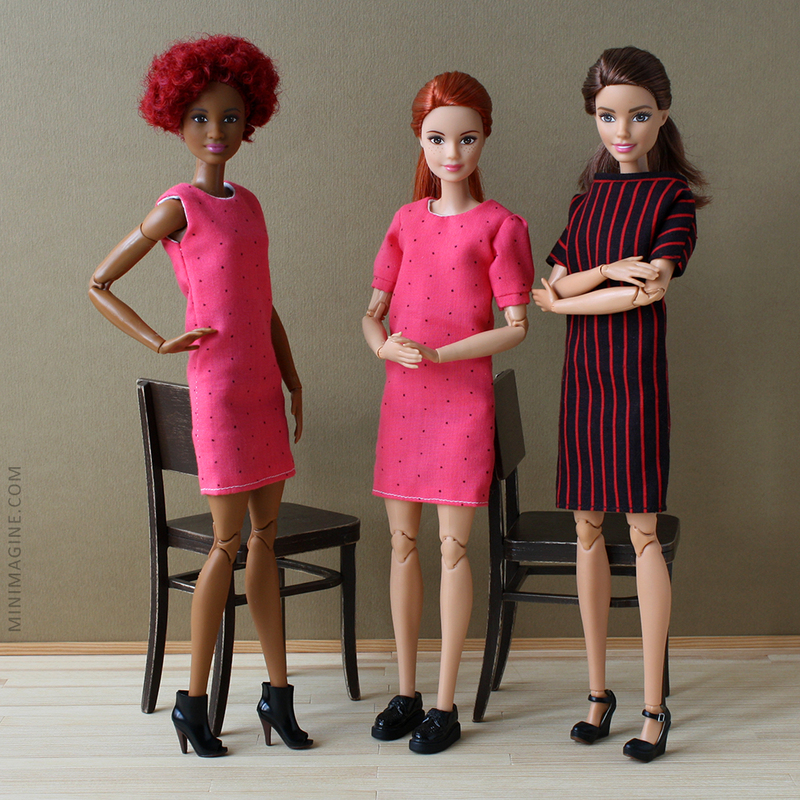 I don't know which Momoko shoes you have but they are in the majority great for MtM Barbie. Świetne te wszystkie buty i buciki! Niektóre wyglądają jak prawdziwe! Fenomenalne! Buty - marzenie! Są wśród nich pary, które wyglądają jak "ludzkie"! Thank you for posting these tips. I wondered about Momoko shoes for these girls as Momoko shoes are one of my favourite designs in both style and detail. What doll or fashion pack did the white oxfords come with? The white oxfords are from "Barbie Fashionistas 42 Blue Violet Doll & Fashions - Petite"
Wow! These reviews are really helpful. When I'm done with my Barbie Romeo and Juliet stop-motion video (starring Momoko as Juliet), I plan to do a Barbie/Lammily pirate movie. The boots review will help me cast the roles in my next film. Thanks a bunch!